".and speaking of recreation, the area received much national attention in the late 90's when the sprawling 18 hole Widow's Walk Golf Course opened adjacent to the historic North River and within eyesight of the Atlantic Ocean. It was later named American's first "environmental demonstration course," and has since been designated as an Audubon International, Certified Audubon Cooperative Sanctuary. (There's nothing like supreme bird watching while shooting four under par on the back nine). " When Widow’s Walk Golf Course opened in 1997, course officials made a point to exercise their environmentally friendly muscle even before it became the norm. But golfers balked at the course’s new style of drought-friendly grass, which was intended to go dormant and turn brown. In fact, many of the courses in Scotland, golf’s original home, use the same type of grass, but the environmentally friendly grass didn’t hold up well to cart traffic, which is something Scottish courses see little of. Brown grass they could explain, but dead, balding patches of brown grass? That was a different story altogether. Going green has been tough, but something management at Widow’s Walk has been committed to since the course opened. But with a recent push from the PGA to construct more environmentally friendly courses, things have become a little easier for Widow’s Walk, which Sanderson said has finally started to receive the recognition it deserves, even if it’s years overdue. As water has become increasingly expensive, the PGA has begun encouraging courses to employ many of the environmentally friendly strategies that Widow’s Walk has been using. To familiarize golfers and patrons with the idea of brown golf courses, they’ve been hosting major tournaments at courses with similar brown patching — most recently with 2010 U.S. Amateur tournament at Chambers Bay Golf Course in Washington. At first, the decision to make Widow’s Walk environmentally friendly was more like a novel experiment, with course managers around the country recognizing the logo on Sanderson’s clothing as “that place,” which had earned a national tag as an environmental demonstration course. The course is also known for another unique factor — that it had been built on an abandoned gravel quarry once owned by the Boston Sand and Gravel Company. The course’s architect, Mike Hurdzan, chose to use the original ups and downs left over from the quarry, which provide unique environmental perspectives as a golfer moves through the 100-acre course. The buzz was there, but golfers needed some reassurance that the course was, in fact, brown by design. As people began to question the brown grass, which began to wither under constant cart traffic, management at Widow’s Walk began to mix in traditional grass that could withstand the pressure and retain golfers. Sanderson said some of the experiments exceeded their expectations, such as environmentally friendly G1 bent grass, which they use as a putting surface. Sanderson said he’s glad that Widow’s Walk was environmentally conscious even before the PGA. Sanderson credits President Barack Obama’s recent visit to the Vineyard and subsequent golf outing on a nationally recognized, fully organic golf course as the reason behind all the recent interest in green golfing. While Widow’s Walk isn’t fully organic, it is one of a handful of courses that are members of the Mass Audubon, a conservation organization that “protects the nature of Massachusetts for people and wildlife,” according to its website, massaudubon.org. FOR "KIDS OF ALL AGES"
The Scituate Recreation Commission is serving more than 1,000 "kids of all ages" this summer with some 100 offerings in 40 widely divergent programs. Among the most popular of the offerings, according to the Town's Recreation Director, Jennifer Vitelli, are the golf clinics held by Bob Sanderson and his staff at Widow's Walk Golf Course. Sanderson has been a teaching professional for over 30 years and the resident PGA professional and director of golf at Widow's Walk since the course first opened in 1997. His teaching background is impressive and includes serving as the head professional and golf director for eight years at the world's longest golf course, The International in Bolton, Mass., site of this year's Long Drive Championships. As evidence of his stature among professionals, Sanderson was named one of "America's Top Golf Instructors" by the Consumers' Research Council of America. "We have 14 adult clinics (for beginners and intermediates) this summer, and that's on top of another 14 we held this spring. All told, some 200 adults will have participated in our golf clinics at Widow's Walk this year." Widow's Walk also serves as a "summer classroom" for a host of younger golfers. Currently, 58 youngsters, ages 9 to 15, are participating in four, two-hour clinics for beginners and intermediates, with another 70 enrolled in the August clinics. On Tuesday I stopped by to watch Bob his assistant pro, Todd Nelson, as they were teaching a group of beginners the basics of the 'short game:' pitching and putting. The patience of the teachers was very much in evidence as they worked the youngster through the various drills. Bob places two sticks on the ground to serve as a "chute" from which the young golfers aimed their chip shots onto the green. "This is where most golfers lose strokes," he points out. 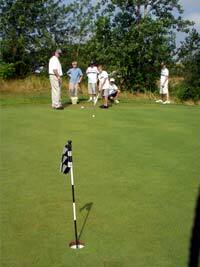 "If you can chip up close enough to one-putt you can cut a stroke off your score. Do that enough times and you will turn in a really fine score." When asked about the clinic, the youngsters responded enthusiastically: "This is a lot of fun," said Jeff Ouellette, 11. "You get to learn a lot and get to hit a lot of balls. He looks forward to playing with his parents, Jim and Anne, and putting the lessons to good use. This clinic is Kerry Buckley's introduction to the game. When asked if it was helping, the 11-year-old lefty replied that "it's been very helpful. They are teaching me a lot. . . like how to hold the club. I really like it." "What a wonderful resource it [Widow's Walk] is for the Town," says Ms. Vitelli. "Before Widow's Walk we couldn't begin to offer programs like this to our residents. Golf is an intergenerational sport and I think it's wonderful that so many youngsters are learning to play a sport that they can participate in for most of their lives." Art Dunphy is a freelance sportswriter and publicist from Scituate. #1 Brian Delgrosso tries his luck at a 25-foot putt as John King, Jeff Ouellette, Matt Reilly and Jack Ayers wait their turn. Asst. Pro Todd Nelson looks on. When Widow's Walk Golf Course opened it was, for a variety of reasons, hailed as a major success. Golf Digest slectged Widow's Walk as one of the best new courses in America It was the first environmental demonstration course built, which set the standard for golf course construction. There was only one problem with the course that opened in Scituate in 1997. It was too hard for the average player. In fact, it was too hard for professionals. Within the first few weeks of its opening, three local professionals played a round together and lost 10 balls. They vowed they would not come back. If a group of pros were frustrated, the beginner, who often starts off on a municipal course, was really at a disadvantage. "I think we were so excited about the course and its design, we kind of overlooked the fact it was too difficult for the average player at first," said Selectman Joe Norton. "We realized we had to make it more player friendly." The town-owned facility tried a number of things to make it easier for players to get around the course. One summer they had a ranger stationed on the other side of a deep gully who grabbed a lot of tee balls and had a basket of golf balls that he passed out to those who didn't carry the gully. But there were many other issues that had to be addressed to get players to return. I think we opened too soon," said director of golf Bob Sanderson. "We had a cold spring and the grass didn't germinate as quickly as it should have. In hindsight, we should have held off and not opened 'till Labor Day." But Widow's Walk opened in July of 1997 and, despite its lack of maturity, the course played to capacity. "It stayed that way the entire summer," said Sanderson. "Demand for tee times was so great, we had to reduce the number of rounds because the course was being overplayed." The cash flow was successful for the town, but many players were unhappy about being shut out and more than 50 percent of the play was by Scituate residents. Some of the criticism (of the course) early on was deserved," said Sanderson. "Some wasn't." A number of greens were not ready. Same with many of the fairways. Turf needs time to mature. It can take years, but we rushed it." "The biggest problem was the edges of the fairways," said Norton. "If your ball rolled off the fairway just a little, you couldn't find it. That had to be improved." The undergrowth took time to be cleared, but the "user friendly program" kicked in. The narrow fairways that were part of the design were not as difficult when the edges were expanded by six to eight yards. "It took time, but now we have a first cut and a second cut," said Norton. "It's never going to be an easy golf course, but it's easier to find your ball if it's off line." Said Sanderson, "This past winter we had a lot of progress cleaing brush and undergrowth. The middle of last year was the turning point. Exactly three years after we opened, in July, people started to make it a point of saying how good the course is." International Golf Maintenance of Lakeland, Fla., took over maintaining the course and Brian Mulreanan is the resident superinendent. The company believes in softer greens and started a program of softening the three different types of greens that were built as part of the "demonstration" design. Today the greens are quick but soft. "Contrary to the belief of many, you can have fast greens and soft greens at the same time," said Sanderson. "A two-inch rough that stopped many balls from disappearing in the undergrowth, where before you couldn't find the ball, was also created. Now you can hit out of the rough." The players who may have been frustrated started to come back and are now part of the regulars who use the course. But there was always a problem of slow play in the early years, mainly because of golfers looking for lost balls. The lost ball issue was alleviated, but now that the crowds are returning, players are moved along where there used to be major bottlenecks. "There was a built-in frustration for many players who did't play the approrpriate tees," said course ranger Ken Ekberg. "We have a guide on the first tee who recommends the appropriate tees for players. We also have a scorecard that really gives good yardage information on each hole. It keeps people from beating themselves up if they're playing the wrong tees." The scorecard is similar to a yardage book that is usually sold separately at many clubs. It give yardage from landmarks on the course back to the tees. There's also a handicap guide at the first tee that helps players of different skill levels to decide which tees to play. For instance, a handicap of fewer than 7 would play the blues, the whites are for playrs with handicaps of 7-25 and silver is for players with handicaps beyond 25. There are also yellow and novice tees. Women with handicaps lower than 18 play the silver, women with 18 or higher play yellow. Sanderson said the right tees make for a far more enjoyable day. "You must go to the right set of tees here more than any other course I've worked at," said Sanderson. "If you don't, you won't enjoy your round. But it's a macho thing for some guys." Another major change in the "user friendly program" was the flipping of holes. The third through ninth holes are now the 12th through 18th. The old 12-18 are now 3-9. "The 12th, 13th and 14th are difficult holes," said Ekberg. "When golfers started on the front side, play would start off slow. It was a problem. But now, with players warmed up by the time they get to those holes, there isn't the delay problem we once had. The change of those holes really make a big difference in the time to play a round here." The "user friendly program" has shown up in the most important area, as far as the town is concerned — in the pocketbook. "I just got a report the other day that says this July topped last year by $30,000," said Norton. "That was $334,000 in greens fee income for the month. The rounds are up month after month. The user friendly program is really working." What does Fusaichi Pegasus, winner of the 2000 Kentucky Derby, and Widow’s Walk Golf Course in Scituate have in common? The short answer is that both were three-year-old thoroughbreds that came into their own in 2000. Widow’s Walk, as most people familiar with the area know, is built on the site of the former Boston Sand & Gravel sand pits, long devoid of vegetation and wildlife and known more for teenage parties than anything else. The "pits," as it was known, presented the Town of Scituate with a unique opportunity, albeit a challenge, to transform this biologically impoverished eyesore and nuisance into an aesthetically pleasing, 18-hole public golf course. . . while satisfying the many environmental concerns associated with its subterranean aquifer, uncommon habitat, and wildlife (which is not a reference to the above mentioned teenage parties). Designed as a links-type course, adjacent to the historic North River and within sight of the blue Atlantic, by Ohio-based architect Mike Hurdzan, Widow’s Walk was heralded as America’s first "environmental demonstration project" in which limited water, fertilizer, pesticides, and herbicides were to be used as part of the ongoing environmental management. The course opened to the public on schedule and to much fanfare in July of 1997. "We played to full capacity from Day #1, and stayed that way all summer," recalls the club’s PGA professional, Bob Sanderson. But success had its price. "It had been a cooler than normal spring that year and the grass didn’t germinate as fast as it would have under more normal conditions," Sanderson continued. "There were a number of greens that weren’t quite ready and the same could be said for many of the fairways. Like any new course, it takes time for grass to mature and by mid-September we decided we needed to cut back on the number of rounds because the course was beginning to show signs of being over-played. The result was a lot of people early on were left with a bad taste in their mouths. Some of the criticism was deserved. Some wasn’t." In 1998, Golf Digest listed Widow’s Walk among its ‘Best New Courses in America,’ but like any true thoroughbred [to continue racing simile] it still had some growing to do before making its way into winner’s circle. A year later International Golf Maintenance out of Lakeland, Florida, took over maintenance and under the supervision of IGM’s Greg Mackintosh and Brian Mulreanan a number of changes were instituted which, along with the normal maturation process, have substantially enhanced the playing conditions. "This will never be an ‘easy’ course," Sanderson cautions. "The 6,403-yard, par-72 layout has some challenging holes and being so close to the ocean, wind very often comes into play. But it is should be an enjoyable and aesthetically pleasing experience for anyone who plays it, especially if they play the appropriate tees. There are four tee boxes at each hole-blue, white, silver, and yellow-and Sanderson points out it is extremely important for golfers to play the tee appropriate for his or her ability. "You must go to the right set of tees here-more than any other course that I have ever worked-or you won’t enjoy your round," the Pro promises. For the record, the recommended tee, based on your handicap, is: For men: Blue-under 7, White-7 to 25, Silver-over 25, and Yellow- Novices. For women: Silver-under 18, and Yellow-18 and above. Note, the term "Lady’s Tee" is not used here. And enjoyment is what it’s all about. Widow’s Walk remains a ‘work in progress.’ IGM’s maintenance crew maintains a high profile around the course, continually trying to make those little changes that will make the difference to golfers. And it’s working. "Last July, exactly three years after we opened," Sanderson recalls with a smile, "golfers started stopping by the Pro Shop in increasing numbers to tell us how much they enjoyed playing the course." Just like Fusaichi Pegasus, Widow’s Walk ‘came of age. . . right on schedule.’ Bob Sanderson invites you to come and try it for yourself. "Whether you’ll be playing Widow’s Walk for the first time, or if you’re someone who played it once back in 1997, you should find it an aesthetically pleasing experience." -Art Dunphy is the former editor and publisher of Yankee Golfer Magazine. He is currently a freelance sportswriter and publicist living in Scituate.